Since the beginning of the era of artificial sweeteners, consumers have been encouraged to use them instead of a regular sugar- especially those suffering from type 2 diabetes and obesity. However, artificial sweeteners are not just an innocent, calorie-free substance that makes you life sweeter without any harmful health consequences. In fact, they increase the risk of type 2 diabetes and obesity as proven in new research from the Washington University school of Medicine. Researchers from WU in a small study recently discovered that the artificial sweetener Sucralose (known as Splenda) affects the body’s ability to manage glucose (sugar) intake and insulin levels in the blood. [adrotate group=”5″]The research was carried out on 17 individuals suffering from severe obesity (having a body mass index over 42 ). None of them were consuming Sucralose regularly, nor suffering from diabetes. The study group was asked to either consume water or sucralose (Splenda) before undergoing an oral glucose tolerance test (OGTT). An oral glucose tolerance test (OGTT) is a medical test where a glucose (sugar) solution is given and blood samples are taken afterward to determine how quickly glucose is cleared from the blood. It is usually performed to test for diabetes and insulin resistance. The participants were tested twice. In the first visit of the study they were asked to consume a glass of water before undergoing the OGTT. In the second visit, the experimental group was asked to consume a sucralose (Splenda) solution before undergoing another glucose tolerance test. Their blood samples were taken to compare both results. Researchers were astounded by the results of the study. When the experimental group consumed sucralose (Splenda) before undergoing the blood test, their blood sugar levels were significantly higher compared to the results when they only took water before the test. As well, the insulin levels were 20 % higher in the experimental phase when they consumed Sucralose. Researchers point out that increased insulin levels might be a good sign as it shows that the body is able to deal with spiking blood sugar levels. However, the constant production of insulin is very risky as the body’s cells might become insulin-resistant; this is a significant risk factor in developing type 2 diabetes. This information could serve as a wake-up call for people who regularly drink sodas or eat food sweetened with this artificial sweetener. Another study presented at a meeting of the American Diabetes Association reveals a shocking discovery that diet soda consumers compared to regular soda drinkers had significantly greater waistlines over a 10 year period and considerably greater risk to develop type 2 diabetes. This information doesn’t imply that regular sugar sodas are healthier than diet ones. It simply reveals the truth that artificial sweeteners have the ability to cause our body to trigger certain responses like insulin and sugar level spikes. 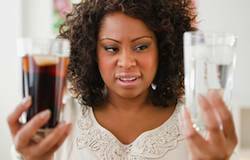 Obviously, any type of soda whether it is regular or diet has the ability to increase blood sugar levels and also increase calorie intake. Wouldn’t it be much healthier to quench our thirst with a zero calorie drink, given to us by Mother Nature herself and so essential to our bodies- water? I’ll really appreciate if you click the Facebook button and share this article with your friends (it’s however, of course, completely up to you). And then of course share your comment below. I never liked the taste of diet sodas or any kind of sodas.Better, stick with water or natural juices.. It is a sad indictment of our society that Soft Drink Manufacturers feel they have an open licence to produce rubbish and advertise that rubbish as healthy, plus a benefit to those who have a weight problem. The Funny (tragic) part that never ceases to amaze is when an overweight person orders a “Large Hamburger & Fries then asks for a Diet Soda Drink”. A lot of the Chemical Manufactured Artificial Sweeteners have been linked to more problems than just Blood Glucose Levels, I read an article on another health site where some of those sweeteners have been alleged to have caused problems in brain function & mental disease or disorder. Personally I use and have used “Stevia Powder” for many years, I’m told it has an after taste, but so far I do not notice it at all. Oh yes I forgot to say I also consume at least two litres of Filtered Water per day at this time of the year (Winter For Us In OZ) and almost twice that amount during our Summer. That doesn’t include the two litres I take out with me on my bike ride…? Are there any sweeteners that have no bad effects? Sucralose was meant to be the great saviour – now perhaps not. Saccaharin leaves a terrible after-taste! Aspartame is banned by some air-lines for their pilots. Anyone care to enlighten please? Is it safer to take the 100% duces or the effect is the same. At times it is difficulty to take on its own. People who are developing diabetes 2 are regularly drink sodas and eat food sweetened with the artificial sweetener.Water is best drink for us. Thank you for this very informative article, particularly about the artificial sweetners and their effect on blood sugar levels. I am wondering about the use of Stevia extracts. Are they less of a problem in and of themselves ? I have Type II Diabetes and it is well controlled through diet. I like my coffee and tea sweetened and Stevia seems to do the trick. What say you ?